Is there another SteamWorld game in the works? Image & Form, the Swedish development studio behind 3DS eShop title SteamWorld Dig, stated on Twitter earlier today that it will be making a huge announcement tomorrow. Seeing as the tweet — which is shown below — tells us to speculate about what this could be, we thought it'd be rude not to. The Japanese release of the game (which was today) is mentioned within the same tweet, and as a result we can't help but think that this upcoming announcement is 3DS-related in some way. Back in September, we caught up with the Image & Form's Brjann Sigurgeirsson, who confirmed that work was already well under way on a new 3DS eShop instalment in the SteamWorld Dig series. Is it possible that we'll finally hear more details about this upcoming project tomorrow? Are you hoping for a SteamWorld Dig sequel or would you prefer to see an entirely new title from Image & Form? I hope they make a run n gun. There is loads they could do as Steamworld games and they seem to have interesting ideas. 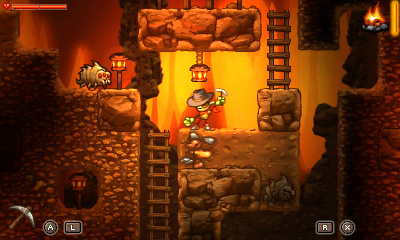 Steamworld Dig sequel... on BOTH 3DS and Wii U. Now that would make my day. Steamworld Dig guaranteed I'd buy whatever they put out next, so sequel or original idea won't affect me too much. I'd love something new from these guys. They definitely know what they're doing. Probably a begged vita port wich I would be happy for them but I wish more for a steamworld HD collection or one with extras. Wii U HD release most likely. Steamworld Dig 2 release date, PLEASE! hope it will be on 3ds and wii u. Just recently bought the game and its awesome. Simple but clever gameplay. Good for them. Dig is fantastic and they deserve success. please, NO Wii U HD version!!! I don't think a sequel would do much for me. They have the assets so they could do all sorts of interesting cool things. God this game was so fun. I hope its a sequel and a Wii U version. I'll buy them both. Best downloadable game on 3ds this year imo. @Swiket You summoned us, O Master...? Ask whatever within 3 minutes, and ye shall receive. @imageform America is sleeping Good luck on the upcoming announcement! I'd not touch the HD remake with a long stick. I mean - what's the point of releasing the same game over and over again with just updated graphics? They have already said before it is a new game but in the same world. (Not interested in a sequel so much). well, no new announcement yet. can't wait, @imageform ! They said they were doing something completely different in 2014 but in the same world. Well I got the HD part right. Big announcement is for PC HD version right?